Description: Experience the fresh, thrilling, and fun urban-setting adventures of Tsujimoto Natsumi, Kobayakawa Miyuki, and other members of traffic police officers of Bokutoo Precinct. From the unexpected traffic busting on Natsumi's first day of work. The officers' hard effort to capture a maniac racer in a yellow Lancia car in the middle of Tokyo's most fierce typhoon. The tense and shocking so-called love affair going on in Bokutoo Precinct, to the emotional and touching final episode that contains a major issue concerning Natsumi and Miyuki, the Dynamic Duo of Bokutoo. Witness how they interact with their duties and society in general. You're Under Arrest! is such a fresh, light-hearted, and enchanting anime series that no anime fans should miss! It is a very exciting experience for me to review YUA OVA because this is one of my most favorite animes. This anime is based on the manga You're Under Arrest! written by Fujishima Kousuke, who is also the author of Aa Megami Sama! There are no weird creatures from out of space or weird people with colorful hair ... however this anime is very different from many animes I have seen so far (at least I think so). So bear with me and be my sidekick in my car ... Pressing my gas pedal ... and oops, I almost hit a bypasser (sweatdrop). The OVA begins with the episode titled And So They Met! ?. starting off with Tsujimoto Natsumi, a new transfer police officer, riding her beloved Motor Compo to her new office. Later she ends up being busted for her inappropriate riding manner. Soon, the rumor spreader Nikaidoo Yoriko (ohoho she can be the source of many troubles), "The White Hawk of Bokutoo" from the motor patrol division Nakajima Ken, and then the mechanic freak, and soon-to-be partner Kobayakawa Miyuki will be Natsumi's closest buddies. The tomboy Natsumi and her feminine new partner Miyuki encounter their exciting first mission to catch the mysterious figure named "Mr. Fox. The thrilling 2nd episode is titled Tokyo Typhoon Rally. Warning, warning!! Typhoon is here!!! The Dynamic Duo is patrolling around the city and then hearing about the typhoon. Hehe see how popular our Dynamic Duo and Ken chan (that is how the kids call him ^_^) are among the preschool kids ^_^. The sudden appearance of the cop hating yellow Lancia obligates Natsumi and friends to catch this ballistic maniac, so traffic regulations will still be followed. And another problem occurs (u'll see after u see this episode ^_^). Don't miss the great sequence of another car chase ... in the middle of a yphoon. Ooh (in awe). The 3rd comedic episode is Love's Highway Star. This is probably my favorite episode of the YUA OVA. I am sure that u'll later find out why this episode just lures me into watching it over and over again. Romance is on the rocks when Yoriko, the famous Bokutoo's gossip reporter, spreads that news that Miyuki is attending an omiai (a matchmaking session in Japanese, and it is still pretty common for Japanese to do this) on her weekend off. Everyone (including the Captain himself) knows there is something between Miyuki and Ken, pretty obvious one hehe. And thanks to Yoriko, she makes things more complicated hehe ? do not miss seeing her being wrapped up into a present!! The last dramatic and emotional (not sappy or cheesy I tell u) episode is On The Road Again. Natsumi agrees to take a new job (in the elite motorcycle patrol section) offered by her Captain. What is going to happen to Bokutoo's Dynamic Duo? Basically, since Natsumi left, Bokutoo Precinct has been down; even the cafeteria lady misses Natsumi's big appetite. Miyuki and friends are still not used to not having their active and energetic friend around. Can Miyuki stand her new carsick partner? A truck is on fire when Natsumi is on her new duty on a marathon day. The whole traffic around the marathon turns chaotic. Without the help from Natsumi, can Miyuki and friends handle the disorder? Well after what I have said ? u may wonder what is the conclusion to my opinion to this OVA series. There is one word that I can say a million times about this series ? great great great great (well this is obviously not up to a million yet ? otherwise it will fill up the whole page hehe =P). This series has cleverly combined all the necessary elements needed in all anime series, drama, comedy, and action. There r also other aspects of this anime that I really like. The stories are nicely written, sometimes makes me wonder how it feels to be a traffic police officer hehe. Great music that matches with the scenes well, I recommend u to have the soundtrack to this series ^_^. Sharp character design that is nicely done by Nakajima Atsuko, who has also done some Ranma 1/2 series. The voice actors and actresses' voices fit the characters very well, especially Kozakura Etsuko (voice actress of Yoriko) ohohoho. This anime's stories are great examples of showing how the traffic police officers interact with their duties and the society. Although this is an anime, I can still feel that the stories, locations/settings, and the characters are very real and believable. It is the simplicity and realistic aspect of the stories that I like the most ? no deep weird meanings behind them. Even though this anime sticks to reality (police officer's life) ... it is soooo far from boring, that is the main reason why I looove this series ^_^. This anime rocks big time!! Um mina ... I gotta run now ... I gotta avoid the cop chasing behind me ok? Sore ja mata~ ne! Do not miss Natsumi carries her Motor Compo on her shoulder in the first episode!! Witness how Natsumi can punch a truck's window ''till it breaks! Ohoho talking about being strong there and Natsumi happens to be the daughter of a famous wrestler ^_^; Kowaii! I recommend u to go to a link listed under our Anime Links and then go to the site titled Taiho Shichauzo and The Modern Japanese Police Force. Hopefully after reading the great information of Japanese society, their police force and comparisons of YUA and the real Japanese police force, you will learn more about YUA and the Japanese society. Do u know that in the opening credit ... Miyuki and Natsumi r traveling south on the Shuto Expressway No.1? And then train going past them is the Haneda airport monorail (this info is credited to the author of the site Taiho Shichauzo and The Modern Japanese Police Force). And in the ending credit, Natsumi and Miyuki are driving back up to the Shuto Expressway. Oh-oh! I think You're Under Arrest OVAs have already been listed in one of my favorite animes list already ? hee hee ^_^ Well, to be honest, the stories' structures aren't as exciting as I expected. It doesn't have any shots of gun or physical fighting, but you will gain certain kinds of feelings that you will want to watch them once again. I think is because of the friendship between Miyuki and Natsumi and cooperation between co-workers in the police station. Don't miss the ending song. It is one of reason I like You're Under Arrest OVAs. I have a little secret to share with you. If you pay attention to the stuffing dolls in the ending song at the OVA 1 then it won't be too difficult for you to figure it out why did I say it is very romantic to me?. He he he (an evil laugh ^_-). Hopefully, it will help you to catch the picture. Hey, hey, hey, why are you still sitting in front of the computer? What are you waiting for? Don't just read the reviews. Go get the tapes now. I promise you that the tapes will be 100 times more interesting than my review ^_^. Cute! Whoever thought a series about policewomen would be so cute? Of course the fact that traffic is their main jurisdiction may have something to do with that. Adorable characters, silly situations and high production values make this series a great one. It's hard not to like someone like someone at this crazy police station. Besides our charming leads, there's the shy motorcycle cop, the office gossip (oh seeing her behind the wheel is a treat) and of course the trying-to-act-gruff-but-failing chief. There are car chases (lots of car chases), office romance gone silly (be you never thought it took a whole police department to make sure a date doesn't go awry!) and, of course, a story of friendship between two women who are different as night and day. It is interesting to note that while based on a manga series, the OVA episodes are original stories that mostly serve as prequels to the manga. The later TV series adapted more of the original manga storyline. Car and motorcycle nuts take heart. Much attention is a paid to the vehicles in this series to keep them as accurate as possible, baring of course, Miyuki's modifications and Natusmi's foot breaks! A truly fun series with a lot of appeal. You're Under Arrest is a pleasant, engaging comedy, with very good art, based on the first manga by Kosuke Fujishima (Oh My Goddess), recommended. It has no fantasy or science fiction elements, and no larger-than-life heroes or villains; it has some unrealistic situations for comic or dramatic effect. It is somewhat reminiscent of another, lesser policewoman comedy, Every Day is Sunday (Mainichi ga Nichiyobi) by Yuzo Takada (Nuku-Nuku, Blue Seed, 3x3 Eyes). 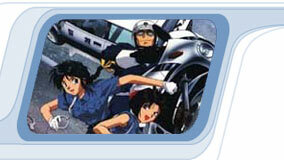 The series focuses on the main characters, beautiful Tokyo traffic policewomen Natsumi and Miyuki. Natsumi is strong, outspoken, impulsive, and always late. Miyuki is quiet, thoughtful, punctual, and sweet. (The contrast is even in their names: Beautiful Summer vs. Beautiful Snow.) They meet in the first episode, and despite (or because of) their contrasting natures, become partners, roommates, and best friends. The interactions between the two, the other members of their mildly eccentric precinct house, and the petty offenders they chase, provide the comedy and interest of the series.